Our landlord recently told us that she’s not going to let us renew our lease, so Suz and I have had to find a new place to live. We found an apartment in a duplex right down the street and it’s great, but it’s a little smaller than the place we’re in now so we’re going to have to get rid of a few things. This morning we sold two end tables and a matching coffee table. Thank god for Craigslist, eh? Suz and I are going to miss our spacious house and our lovely end tables, but there’s a feeling of freedom that comes with simplifying one’s life. It can be good to downsize, to divest oneself of excess baggage. Rob Neyer agrees (subscription required). 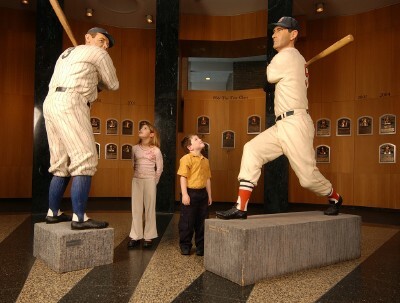 Today he blogs about some of the players he’d kick out of the baseball Hall of Fame. He says he’d boot about 25 percent of Hall members. Neyer’s attitude is downright umpbumpian. This winter, Nick wrote two posts on the topic of “fixing the hall.” In the first, he talked about the players he wants to induct. In the second, he talked about the players he wants to kick out. Give them a read to see how Nick and Neyer match up. I’ve seen the Zebulon Mudcats. “Muddy the Mudcat” rides around on an ATV in the outfield between innings. Awesome. Yes, I must clearly see the Mudcats of Zebulon. They are early favorites because I am always partial to teams that have either “mud” or “cat” in their name (Toledo Mud Hens, New Britain Rock Cats, New Hampshire Fisher Cats), and of course, the Mudcats have both! Also, they play in ZEBULON. I have always secretly wanted to go to the planet of ZEBULON and meet with the Zebulonian prime minister and ask him when he is going to comply with Federation laws and stop using his nefarious cloaking devices. The Mudcats are worth the stop, and Zebulon is only about 40 minutes from Durham. The Bulls ballpark is really nice, and they have a great gallery of players that came through there when Durham was Atlanta’s AA team. If you do make it to Durham, take the time to go to their old ball park where Bull Durham was filmed in part. It is only a couple of miles away. Also, Raleigh is right in between the two and has much better hotels and restaurants than you will find around the ball park in Durham. There isn’t any place to eat or stay in Zebulon so I would suggest not trying to stay there. From Durham, you can get to right on 85 to Burlington, Richmond, Greensboro, or Charlotte. Asheville is also good and in a great area, but it’s not really close to anything. Good luck and let us know what you decide. Depending on how you go about it, you can hit Asheville, Winston-Salem, Greensboro, Burlington, and Durham pretty easily since they are all on I-40 (in that order). The Greensboro stadium is newer than most, and right in a great downtown setting. I would skip a WS Warthogs game for that, honestly. I’ve played at the Mudcats’ stadium, and it is a good one too. Whoa Sarah… you’re pretty cute. Niiiiice. I definitely say the greensboro grasshoppers and the winston salem warthogs, and would DEFINITELY see the Durham Bulls, just for the movie factor. I lived in that area for a long time and the bulls were always great to go see. Miss those times. Carolina mudcats aren’t too shabby a time either. I can’t believe you’re not driving the extra 5 hours to see the Batavia Muckdogs. The NY-Penn League is definitely under-represented on this trip. Scott, I bet you don’t even know whether I am the brown one or the yellow one, fool!!!! But either way, yes, me and Suz are both cute. There is simply no denying it, just as there is no denying Coley’s mad duct-taping skillz. And Townie, I am headed SOUTH. I am going to drink sweet tea, eat hushpuppies, and sing Alan Jackson songs. I am going to frolic in the sunshine. I will drink RC Cola and eat red velvet cake. The NY-Penn League and the Eastern League will just have to wait—but because most of them are relatively close to Beantown, I hope they will not have to wait long! Of course…having posted that I now see that the NY-Penn League doesn’t start for another 20-something days. Great. But July 5th, the Vermont Lake Monsters at home against the Batavia Muckdogs. Does it get any more exciting than that? Sara, knowing you’re a Sox fan I’d head to Greenville. The Drive have a nice new stadium modeled on Fenway but without the exorbitant prices and lack of parking. Plus they have some pretty good prospects this year like Ryan Kalish, Oscar Tejeda and Dave Mailman. The Wilmington Blue Rocks run a good show also. Any team with a piece of celery as its mascot is worth going to see. I’ve seen a Lynchburg Hillcats game back in high school. The only thing I remember was me and my friends trying to take a photo with their mascot only for the shot to be invaded by a random old lady who REALLY wanted to be in it. Oh, and my fear that my minority status was going to get me killed in a place like Lynchburg. Good times. For some reason, I also recall owning a Chattanooga Lookouts hat when I was younger. Am I imagining things? I haven’t been, but I’ve heard the setting in Chattanooga is fairly idyllic. And it’s a great city to boot. And if you make it to Chattanooga, you’re just an hour and a half from seeing the Rome Braves, who play in another great mountain town. Should also mention that this will be the last season for the Richmond Braves at The Diamond. (They’re moving to – *wretch* – Gwinnett County.) It’s right off of I-85.